It seems to have been green drinks week here on FoodStuffFinds, but here I have the full set of traffic lights. A buddy of mine brought these in to work on successive days and let me have a small cup of each for review purposes. First day was the green one. 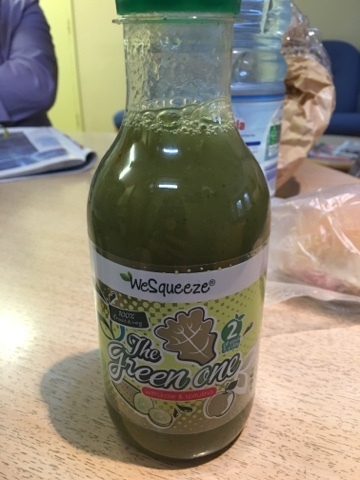 Make no mistake, green drinks turn heads - and as this one smelt of bin juice some stomachs too! So what is this? Well it's clearly good for me as it's got good things in it. 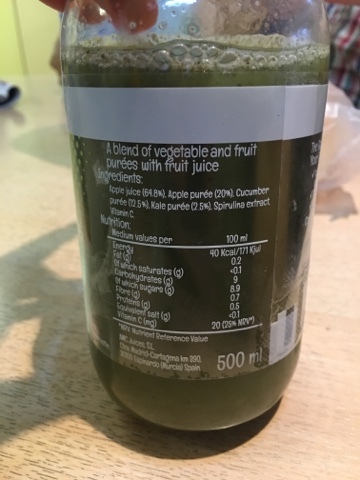 Specifically it's 84% apple juice and purée - but it's the cucumber and kale that give it the haunting smell. Thing is, it just tastes like particularly sweet apple juice! Really quite pleasant and drinkable and one I could have again if I wanted something that looked scary but was basically apples. ...oh - apples again. 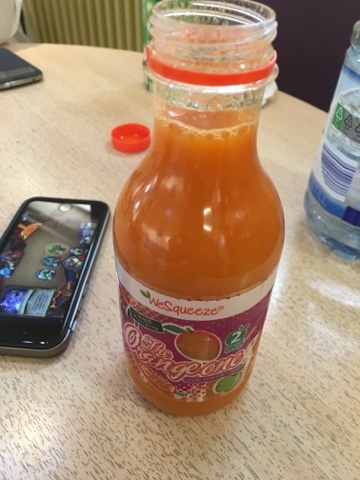 This time we have 70% Apple and 20% carrot but it's the mango that shines here even though that's the remaining 10%! It thickens the whole thing and tastes like a Rubicon juice mixed with yesterday's sweet Apple. Probably less drinkable than yesterday, but more refreshing. ...apples! 92% in fact - they weren't even trying here. 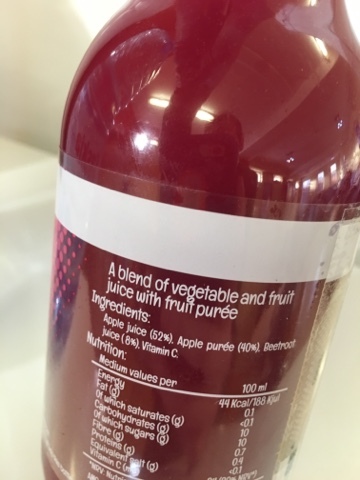 The strength of beetroot means that like the mango it's been blended to just peak out ahead. 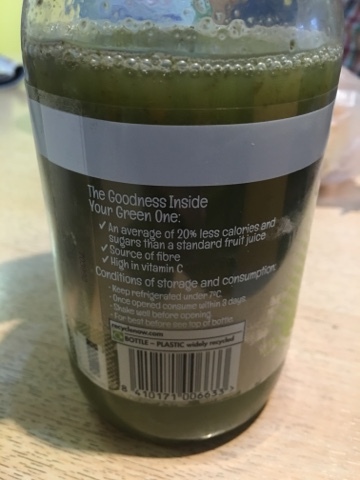 Maybe the vitamin c added was to help calm it flavour wise, maybe because the contents here aren't the most nutritious of things compadre to carrots and kale. 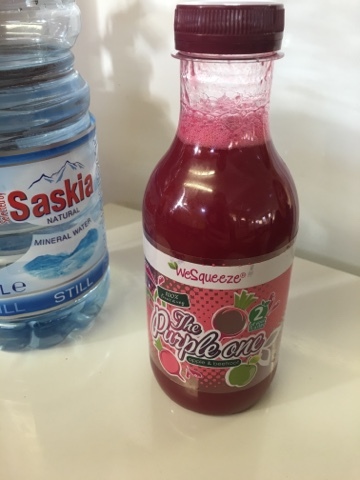 A nice sipping drink that isn't as insane as the pure beetroot drinks but can be enjoyed. 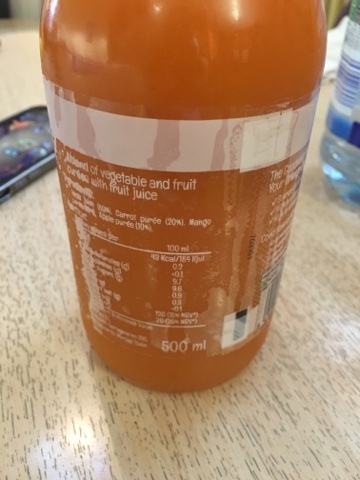 So - if you want Apple juice that is pretending to be other things, where all the nutritious pulpy bits of the fruit and veg has been reduced to a more drinkable consistancy then this is for you. I'd rather blend my own and have all the pulp, but then that really is more hassle and not possible when out. Given a free choice I'd pick them in the order reviewed and take the green first, but the mango is maybe the most interesting of the three and more of a stand out in the flavour category than I'd expected. I love these drinks especially the purple one. I don't really buy into the health claims though. I just like them for what they are, really good tasting drinks.